Find hidden books, fauns and golem puppets! 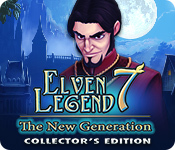 Elven Legend 7: The New Generation Collector's Edition is rated 3.9 out of 5 by 11. Rated 5 out of 5 by connieanddan from I love it, I love it, I want some more of it!! This new edition did not disappoint. Great characters and graphics, interesting storyline, just enough challenge and bonus rounds that were worth the extra money. Absolutely buy this one. I look forward to the next one!! Rated 5 out of 5 by AliceWonders from They listened to my feedback! :) I've enjoyed every Elven Legend game and this was no exception, but the one minor annoyance was the way the Princess said "Interesting!" (I could play without sound but then you lose the other sounds.) I mentioned it when reviewing a previous Elven Legend, and the makers have indeed done something. I also like the new character and concept, yet it still feels like an Elven Legend game. Good stuff! Rated 5 out of 5 by JeansLady1 from Instant Buy I had the joy of beta testing this game. I keep a log of the games I beta test and make a note for each one. Beside the title of this game I had written "Buy this one!" I found it to be everything joybelle has already written about. It's a terrific TM game with lots of features to keep you entertained and engaged. I'm one of those folks who does not play for the 3 Star goal. I tried that once and it took all the fun out of the game for me. I want to take my time and soak it all in. I'm big on graphics and details in each scene/level and playing in a mode that is timed takes all of that away from me. In many TM games, there is still the strategy/challenge of doing things in the right order so I don't have to replay a level. Rated 5 out of 5 by joybelle_1 from Its got the LOT, Strategy, Fun, and Entertainment For a game to be called a CE it should contain a strategy guide, collectables, bonus levels, concept art, wallpapers and achievements. This one has the lot. The next generation is the story of the young Elven princess who can bring inanimate objects magically to life, and her journey home from her G'pa's back to her parents Castle. It is quite fairytale like in its theme. 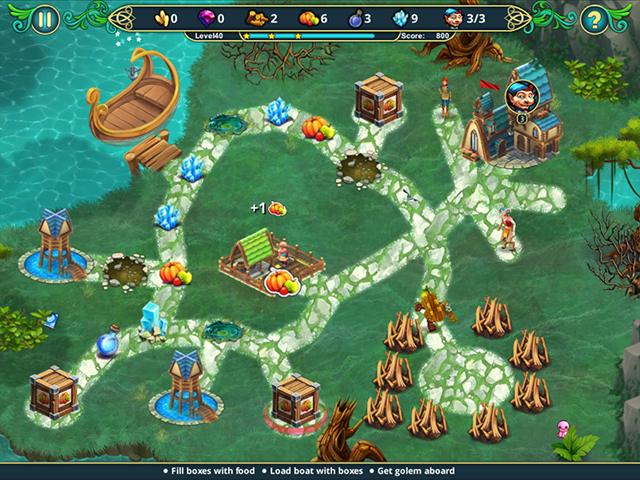 The game itself has three modes of play including relaxed, and there are 50 levels and 10 bonus levels There are three achievements on every level, a book, a cute pink Gollum and a tiny and hard to spot morphing faun statuette. The strategy guide is easy to flip down, accurate and has them clearly marked for each level. 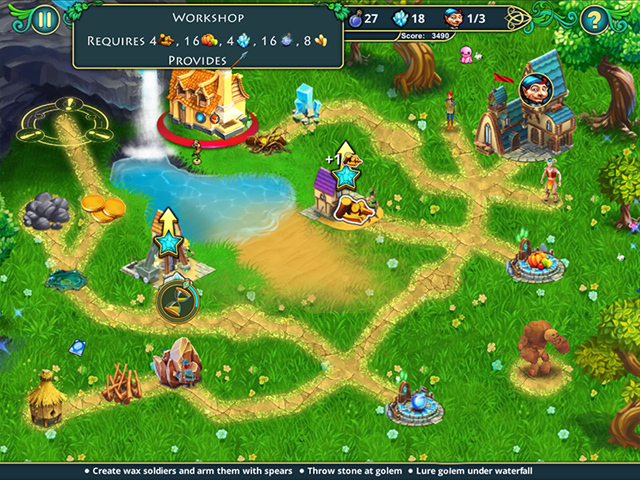 (you can go back and get them too) This game will keep you busy and there is no slacking off even for resource gathering. Sometimes resources appears on altars, but often you have to cut your own wood from a tree or pick your own food. There are bonuses for speed and production, and upgrades to buildings. In that respect most buildings are familiar to other games in the series. The gameplay however is not so much. Every level is so different from the last you are never repeating a goal, its never the same scenery and it keeps you very busy figuring out the game screen (while searching for collectables!) Whilst it is a 'fairytale' theme, its not totally cutie pie, there are rats and villians, craftsmen, soldiers, traders and mythical creatures. The graphics are terrific, and the game play is extremely smooth. I was so pleased to see that number seven in the series had me challenged, immersed and smiling. Yes its a standard 'collect and meet the goals' TM, but the journey is first class. Try the demo. I think you will be hooked. Enjoy! Rated 4 out of 5 by Momma_Llama from Mostly fun I enjoyed this game, but found that now and again I would have to restart because it wasn't clear on how much of a resource I would be able to use without running out. That's annoying. Still, it was fun and well thought out. If you don't mind restarting a few times, it's a good game. Rated 4 out of 5 by plat1098 from Fans Won't Be Disappointed New characters replace Aerin, the Griffin and Tillian which actually doesn't interest me all that much. The basic games formula does, which, instead of multitudes of obstacles and paths and structures, always focuses on fewer, more well-thought-out objects and tasks to occupy your mind. In limited time mode (professional and normal), time may well run out while you're trying to figure out how to finish a head-scratcher of a goal. Same as always, and almost always, these are creative, charming and well done. Several collectable objects are present in every scene--meh, could live without although the disappearing one is a good idea. Graphics continue to be mediocre: compare the first opening scene with the game scenes and you'll understand. Audio could also have been improved, with there being two or more music tracks playing at one time--a little discordant. 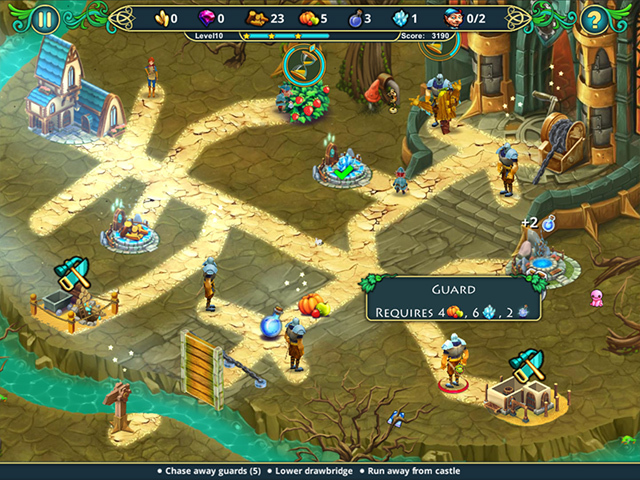 Occasionally, part of the game play was cut off by the task and timer bar. Overall, good and imaginative game, I'm enjoying it. Rated 3 out of 5 by joannes0 from Too difficult These types of resource gathering games are my favorite. The graphics are great, the storyline is cute. But quite a lot of these levels are too hard. You don't realize until after you do it that by upgrading that one resource building, you just used all of another resource and have none for something else. And if you don't upgrade the buildings, then you're sitting here just waiting and waiting while you gather the needed resources for something, which takes forever. I play these games to relax, but having to play a level four and five times isn't relaxing. It's stressful. Wouldn't recommend unless you like to be frustrated. Rated 2 out of 5 by sonje123 from Boring I love time management games, but this one bored me to tears. Was a waste of money for me. I played the game but was not impressed at all. I did not even bother to play the extra levels and started playing other games. This was not a winner. It was way too easy the others in this series were much better.